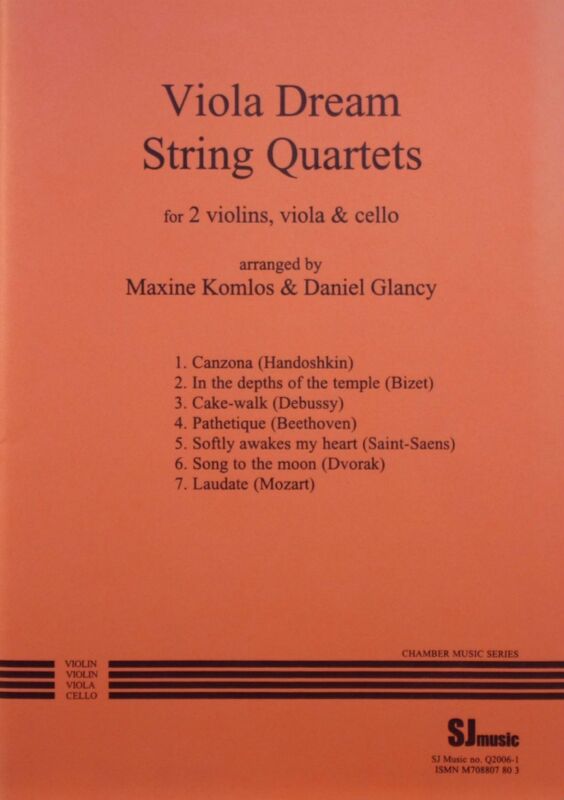 This is a fun collection of seven string quartet arrangements of famous pieces of music, including Debussy’s “Cake walk” and the aria “In the depths of the temple” from Bizet’s “The Pearl Fishers”. The arrangements feature prominent viola parts (and very good 2nd violin parts too!) and were created by Maxine Komlos, with assistance by Danny Glancy, as a result of most composers only giving the viola occasional short solos in their works. An edited version of an article by Komlos, “The case of the tuneless viola”, is printed inside the back cover of this edition’s score (which is included with the individual parts). Komlos was born in New Zealand in 1939 and died in 2004. She studied the violin at Auckland and Adelaide universities and, after her husband Peter Komlos died, she established a Suzuki violin school in Adelaide in 1979.